Players may be the heroes of the Pathfinder Roleplaying Game, but whole worlds rest on the Game Master's shoulders. 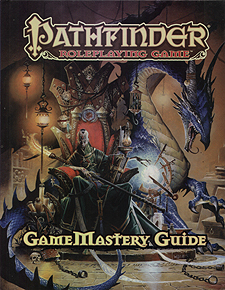 Fortunately for GMs, the Pathfinder GameMastery Guide is here to back you up. Packed with invaluable hints and information, this book contains everything you need to take your game to the next level, from advice on the nuts and bolts of running a session to the greater mysteries of crafting engaging worlds and story lines. Whether you've run one game or a thousand, this book has page after page of secrets to make you sharper, faster, and more creative, while always staying one step ahead of your players. The Pathfinder RPG GameMastery Guide is a must-have companion volume to the Pathfinder RPG Core Rulebook. This imaginative tabletop game builds upon more than 10 years of system development and an Open Playtest featuring more than 50,000 gamers to create a cutting-edge RPG experience that brings the all-time best-selling set of fantasy rules into the new millennium. Step-by-step walkthroughs for creating campaign worlds, cities, cosmologies, feudal systems, and alternative dimensions.